Shovels are in the ground for a new palliative care facility in North Bay. The $7 million facility has been years in the making, but the community continues to raise money. 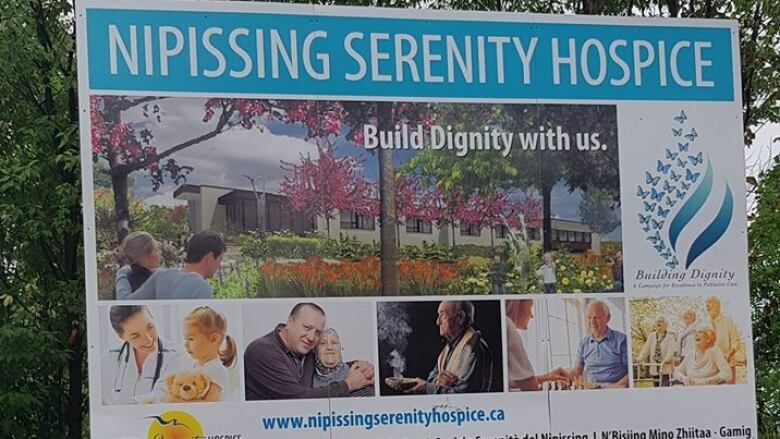 Mathilde Gravelle Bazinet, the chair of Nipissing Serenity Hospice, told CBC News that they keep reaching out to the community, because the government does not fully cover operational funding. "Now it's only 66 percent that is received for operational costs on a yearly basis, so there is a need for constant fundraising," Bazinet said. In one example of community support, on September 16 two 75-year-old women ran from Sturgeon Falls to North Bay, a 40-kilometre run, and raised more than $14,000 for the facility. It's a contribution for a facility that Bazinet said she hopes ends up as an "ideal location." "We wanted it to be central, park-like, and we wanted it to be an environment where the loved ones would be able to go out and walk around, and a more appropriate place for terminally ill to spend their end of their journey," Bazinet said. As for raising public awareness of the hospice, Bazinet said it's important for people to realize that a hospice is not a hospital, contrary to some popular misconceptions. "A residential hospice is a more appropriate environment for the terminally ill," Bazinet said. "It's a home like environment." "There's professional palliative care that will be providing comfort. Not only to the patient, but for the family and loved ones." Click the audio link below to hear the interview in its entirety.